Sketch of Dr. T. C. Cook's Life. Dr. Thomas Chapell Cook of Weimar was born at Tuscaloosa, Ala., Sept. 19, 1836, and would have reached his 70th birthday Sept. 19,1906. His father was Capt. M, Cook of the same state. Dr. Cook received his classical education at Princeton college, graduating with the degree of A. B. In the year 1857, and in due course received the degree of A. M. He immediately began the study of medicine, attending lectures at the University of New York in 1857 8, and at the University of Pennsylvania, from which latter institution he received the degree of M. D. in 1859. He was so proficient in his chosen profession that he was selected as an intern In the Charity hospital at Mobile, Ala., one year before he graduated. Dr. Cook settled in Texas forty-six years ago and has always taken a prominent position in his profession in the state. In 1867 he was elected to the position of professor of malaria medica and therapeuties in the Galveston Medical school which afterward became the medical department of the University of Texas, which position he did not accept, He held the position of health physician for Colorado county for several years. During the war he was assistant surgeon of the First Regiment, Heavy artillery of Galveston, in the Confederate states Army, and after the war became United State examining surgeon of the army and navy. The doctor has always been a staunch believer in the union, but like other Southern gentlemen, would not desert his state In her hour of distress. He served in the legislature in 1885-6, representing the Sixty-seventh district ot Texas, and ran for congress In 1888 against Judge L. W. Moore, eighth congressional district, and received an honorable defeat. The doctor's first wife was Miss Windham ot Stone, Ala, they marrying in 1860. Two children were the fruits of the marriage, Dr. Thomas H. G. Cook of Stone, Ala., and Mrs.
J. E. Cohen of Weimar. His second wife was Miss Fannie Gilliam of Fayette county, Tex., and from this marriage two sons were born, Mr. Ashbel Cook and Dr. Chas. G, Cook of Weimar. His last union was to Miss Mary Gilliam, sister of his second wife, which marriage took place in 1885, she dying sometime in the early nineties. No children were born of this union. Dr. Cook was a bright Mason and member of Weimar lodge No. 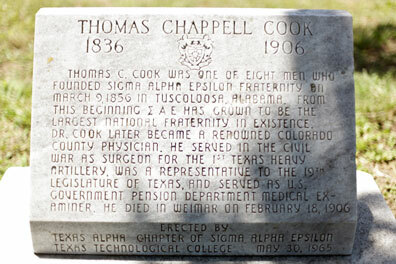 423, A. F. & A. M.
He was one of the three founders of the Sigma Alpha Epsolam, a Greek letter society founded at Tuscaloosa, Ala.
Thomas C. Cook was one of eight men who founded Sigma Alpha Epsilon fraternity on March 8, 1856 in Tuscoloosa, Alabama. From this beginning [Sigma] A E has grown to be the largest national fraternity in existence. Dr. Cook later became a renowned Colorado County physician. He served in the Civil War as surgeon for the 1st Texas Heavy Artillery, was a representative to the 19th Legislature of Texas, and served as U. S. Government Pension Department Medical Examiner. He died in Weimar on February 18, 1906. Thomas Chappell Cook is buried in the Weimar Odd Fellows Cemetery where both of the pictured markers are located.